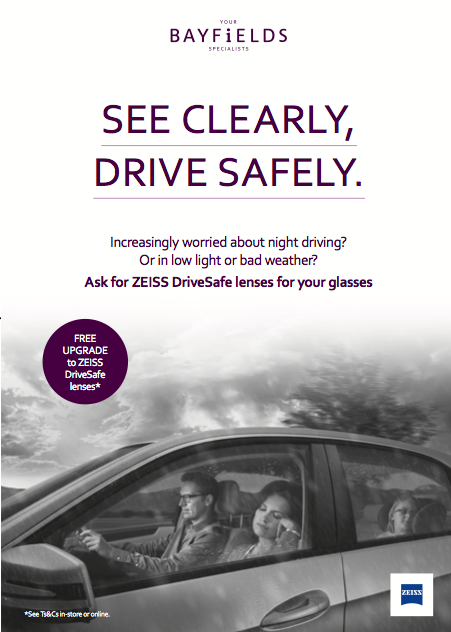 Get a FREE UPGRADE to ZEISS DriveSafe lenses for your glasses at Bayfields Opticians today! Home » Offers » Get a FREE UPGRADE to ZEISS DriveSafe lenses for your glasses at Bayfields Opticians today! Worried about driving at night and in poor conditions? Do you find it increasingly difficult to feel safe when driving in conditions other than good daylight? Glare from headlights and streetlights. Dark days, rain, fog. Having to switch between looking at the road and looking at your dashboard and mirrors. It can all sap your confidence and make you feel less safe when you’re driving. Some people struggle so much that they avoid driving in these conditions, which curtails their enjoyment of life. Don’t let that be you. Upgrade to ZEISS DriveSafe lenses and regain your confidence. ZEISS DriveSafe lenses make it so much easier to deal with glare, poor visibility and adapting your all-round vision when driving. So, as the nights draw in and the weather turns grey, we’re offering FREE UPGRADES to ZEISS DriveSafe lenses until 31 December. They’re available for both single-vision and varifocal glasses. And they come with Bayfield’s own 2-year satisfaction guarantee, too! Don’t miss this offer! 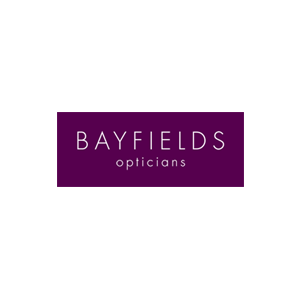 Pop into Bayfields Opticians on the 1st floor today!